Although the seventeenth edition of Primavera Sound is just around the corner, its programme of concerts and activities keeps expanding spreading into all parts of the city. In collaboration with adidas Originals and the support of Sofar Sounds Barcelona, the festival’s new proposal called Primavera a Casa Teva will knock at the door of five private homes to offer live concerts between the 31st May and 4th June, one concert per day, as an integral part of Primavera a la Ciutat. 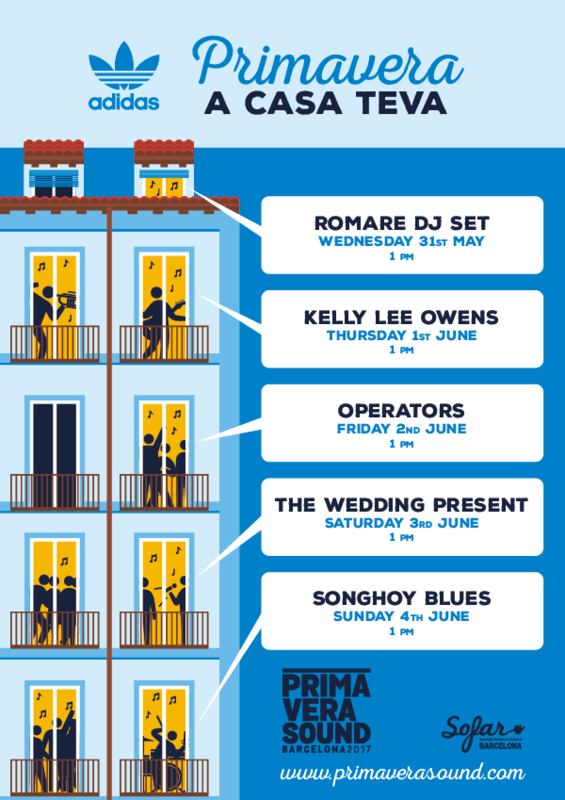 The electronic dance music by British artist Romare in a DJ set will kick off this cycle of intimate shows on Wednesday 31st May in a magnificent terrace of a house in the Born, and on Thursday 1st June Kelly Lee Owens will reveal her disconcerting synth universe in a home in the Raval. Then on Friday 2nd and Saturday 3rd June electronic pop by the Canadian band Operators and that pop institution called The Wedding Present will respectively invade two more homes in the area of Poble Nou. Finally, the Malian band Songhoy Blues will bring their powerful desert blues to a building in Sant Antoni on Sunday 4th June. Those who wish to attend Primavera a Casa Teva will be able to participate in an online competition by filling in this form and win a ticket for two people for one of the sessions only which will take place each day at 1 pm. The lucky winners will receive an email on the 26th May and on the day before the concert in question they will be informed, by the same means, of the exact address.